Georg Philipp Telemann was a German Baroque composer and multi-instrumentalist. Unlike many of his counterparts from this era, he was almost exclusively self-taught as a musician and composer, aside from early organ lessons when he was a boy. Considered by his contemporaries to be a leading German composer and undoubtedly one of the most prolific composers in musical history, his music frequently incorporates varying nationalistic styles. Throughout his compositional career, he always remained a prominent figure and implemented emerging musical tendencies, therefore making his music an important link between the late Baroque and early Classical styles. After studying in Magdeburg (where he was born), and a school in Zellerfeld, he was sent to the Gymnasium Andreanum at Hildesheim. It was here where his musical talent not only took off, but was well encouraged and supported by several faculty and school authorities. Telemann began to teach himself several different instruments and further explore composition. In 1701, he began studies in law at the University of Leipzig, but changed to a career in music (much to the disappointment of his family and against their wishes). While in Leipzig he founded the University Collegium Musicum and began to regularly compose, eventually becoming director of the city’s opera house and music director at the Neukirche. He left Leipzig in 1705 after accepting an invitation to work in what is now Zary, in Poland. With the hostilities of the Great Northern War, his tenure there was cut short and he entered the service of Duke Johann Wilhelm of Saxe-Eisenach, becoming Konzermeister in 1708 and Kapellmeister in 1709. During this period he created an outpouring of works, namely sonatas, church cantatas, and concertos. He wed Amalie Louise Juliane Eberlin (daughter of musician Daniel Eberlin) in 1709, and their daughter was born in January 1711. Amalie died soon afterwards, leaving a depressed and distraught Telemann. 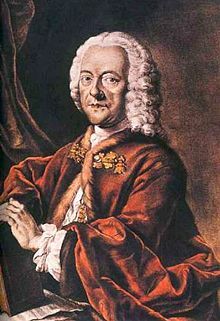 Deciding to relocate after his wife’s passing, Telemann settled in Frankfurt in the spring of 1712 and it was during this time that he fully matured compositionally. He again was a powerful contributing force behind the city’s musical landscape and wrote for nearly every type of musical ensemble. He remarried to Maria Catharina Textor in 1714, and the couple had nine children together. This caused him great personal happiness, which effectively helped him with his compositions. Throughout this period, he remained extremely productive and garnered large success. Ever ambitious and in search of a “better” position, he accepted an invitation to work in Hamburg in 1721, and became the musical director of the city’s five main churches. He was met with some opposition from officials who found his secular music to be too much of a “distraction” for the composer. When the city was looking for a new Thomaskantor, Telemann applied for the job and was approved, but the post ultimately went to Johann Sebastian Bach. After traveling to Paris in the late 1730s and hearing the works of Jean-Philippe Rameau, he began to incorporate the French operatic style into his works (having previously used Italian and German). Aside from these travels, he would remain in Hamburg the rest of his life. This was due in part to the large gambling debt his wife had acquired, which amounted to more than his annual income. He encountered further marital trouble when his wife’s infidelity and numerous extramarital affairs were revealed. Although he would continue to write into the 1760s, his output of works greatly diminished after 1740 and he took up other hobbies. He died from what was only recorded as a “chest ailment” in 1767 and was succeeded at his Hamburg post by his godson, Carl Philipp Emmanuel Bach (the second son of Johann Sebastian Bach). Telemann’s compositional resume includes more than 3,000 works, though at least half of those have been lost, and most unperformed since the 18th century. During his lifetime, he was extremely well regarded by critics, counterparts, and audiences. He was popular not only in Germany but throughout all of Europe. Today, each of Telemann’s works is usually given a TWV number, which translates to the Telemann Works Catalogue. Apart from his compositions, it should be noted that Telemann is equally important for his publishing activities. He set an early precedent for regarding music as intellectual property of the composer, pursuing exclusive publication rights for his pieces.